It was 1952 when conscription was the lot of all 18 old boys, and Allan Stuttard was eager to leave his Hebden Bridge factory work and see something of the world. Allan kept Hebden Bridge Local History Society entertained about his 18 month stint as a private in the Duke of Wellington’s Regiment. And did he see the world? Not straight away. He spent the first 10 weeks square bashing and learning to be a number rather than a name in the barracks in Halifax, just 8 miles from home. It was hard work, but safe. That feeling didn’t last long. The young soldiers were shipped out to Korea where the American and British armies were greatly outnumbered by local forces. The Korean War is often known as the Forgotten War and suffered many casualties. After an interim time guarding borders in Hong Kong, Korea was his ultimate destination. Luckily for Allan, because he was under 19, he was kept away from the front line – but life was still tough and dangerous. He told us that he made three big mistakes. The first was to volunteer…he hoped to be trained to manage stores but ended up on the bomb and mine demolition team. The second was offering to stay behind to rebuild the camp; it so happened to be winter and winters in Korea are exceptionally cold. The third was not to stand in the back row when no volunteers are forthcoming – as those at the back are chosen for the tasks in hand! So did he see Marilyn? Yes he did. He eventually managed to procure his preferred job in stores which made a bargain possible with some members of the American forces, who in return smuggled a group of them into the back of a concert troupe event. Bob Hope – and as he later discovered, a very glamorous Marilyn Monroe – were performing. But from where he was in the audience of thousands, he could hardly distinguish who was on stage, or hear what was going on! Rodney Collinge was both a pupil and a teacher at Calder High School, and now as he looks out on those familiar hills, he likes to imagine the people who have walked those tracks in the past. At the Society’s second talk of the month, Rodney described how developments from the Ice Age to the end of the 19th century have left their marks on the area. The glacial melt gouged out the steep-sided valleys, and early people from the stone age, bronze age and iron age forged their living on the hill tops, leaving evidence in the form of flints, stone tools and signs of burial sites, hill forts and stone circles. The Romans too have marched across these hills – the road from Ilkley to Manchester passed through Luddenden and Wainstalls. In the 1950s a hoard of Roman coins was found close to where the river was forded, possibly suggesting a settlement there, and archaeologists are still hoping for evidence of a Roman fort in the Sowerby area. Place name evidence points to later invaders and settlers with –royd and –ley being common word endings from Anglo-Saxon while –by –gate and –rake have Viking origins. The name Mytholmroyd comes from its place at the meeting of two rivers. In the time of the Domesday book there were about thirty households, farmsteads scattered on the hillsides, and this pattern of development persisted for many years, with much of the area being kept for hunting by the lord of the manor as protected ‘forest’ and ‘park’. The middle ages saw the development of the textile trade, with most of the production carried out in the home. There is some landscape evidence of this textile production, with a ‘stretchergate’ in Midgley where the yarn would be stretched and strengthened, and ‘tenterfields’ in Luddenden where the woven pieces would be stretched on tenters. The move to producing the finer worsted cloths saw the growth of a prosperous class of yeomen/clothiers whose fine16th and 17th century stone houses are such a feature of our landscape. Increasing innovation and mechanisation led to the building of ever bigger mills, and the movement of the population to the valley bottoms. Both the remaining mills and the rows of workers’ cottages remind us of that age. The story of Mytholmroyd, like many Calder valley towns and villages then became a story of increasing civic organisation, with elected officers charged with keeping the peace, ensuring the poor were cared for and transport links kept in good repair. The story of the Cragg Vale coiners might be reminiscent of the wild west, but bit by bit chapels and churches, roads, canals and railways contributed to the development of an ordered town with a strong sense of community. That sense of community is only strengthened by an awareness of the past and the people who have lived here before us. Everyone is welcome at meetings of the Hebden Bridge Local History Society, held fortnightly at 7.30 on Wednesdays at the Methodist Church in Hebden Bridge, with the next meeting on 8th February. Mike Crawford will give the Alan Petford memorial lecture looking at the People, Puzzles and Earning a Living as revealed in a study of 17th century wills and inventories. 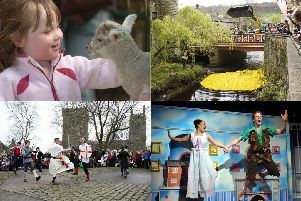 Full details of the programme are on the website www.hebdenbridgehistory.org.uk also on our Facebook page and advertised locally.